Ahsan H. Mansur is Executive Director of the Policy Research Institute of Bangladesh. 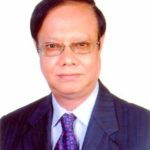 Dr. Mansur started his career as a Lecturer, Department of Economics, Dhaka University in 1976. He left for Canada for higher studies in economics in the same year. As a graduate student and research assistant, he was also offering regular economics courses at the undergraduate level at the University of Western Ontario, Canada (1978-81). Dr. Mansur joined the International Monetary Fund under its Economist Program in 1981, and thereafter completed his PhD in Economics (on general equilibrium analysis) from the University of Western Ontario in 1982.